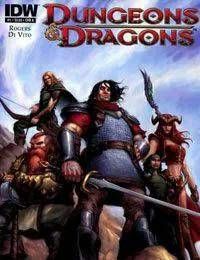 Beginning a new era in Dungeons &amp; Dragonshistory! The genre-defining roleplaying game gets its first ongoing series in more than 20 years! Join writer John Rogers (Blue Beetle ) and artist Andrea Di Vito (Annihilation ) as they bring us a tale of high adventure and deep secrets. Adric Fell leads a band of heroes in a world where civilization has been reduced to a few scattered points of light amid a rising tide of shadows.